It’s been an incredible summer…….one for the record books. In fact, if you know me (or took a quick glance at my Instagram feed), you’d spy something extraordinary. You see it wasn’t but a few weeks ago that I spent days in Orlando, Florida at Walt Disney World. After arriving home, I quickly did laundry and headed back out (suitcase in hand) to Anaheim, California and Disneyland. 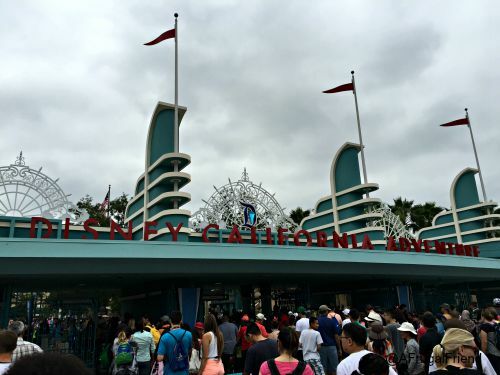 YES – it was a Coast to Coast Disney Summer! There’s a big celebration going on at Disneyland and I wasn’t about to miss it. 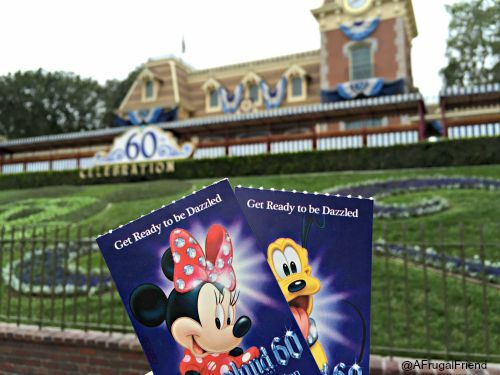 The big celebration —> for the Disneyland 60th Anniversary! A Diamond Celebration trip was in order! 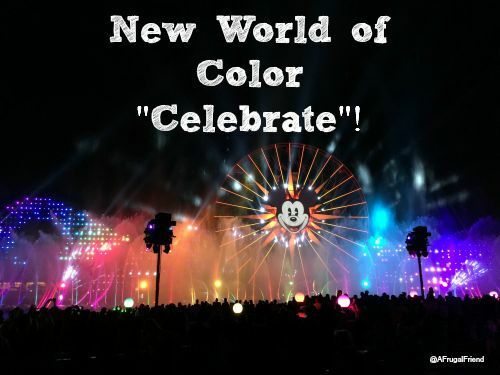 And with a diamond celebration, you can bet that Disney has brought out all the glitz and extra fun. 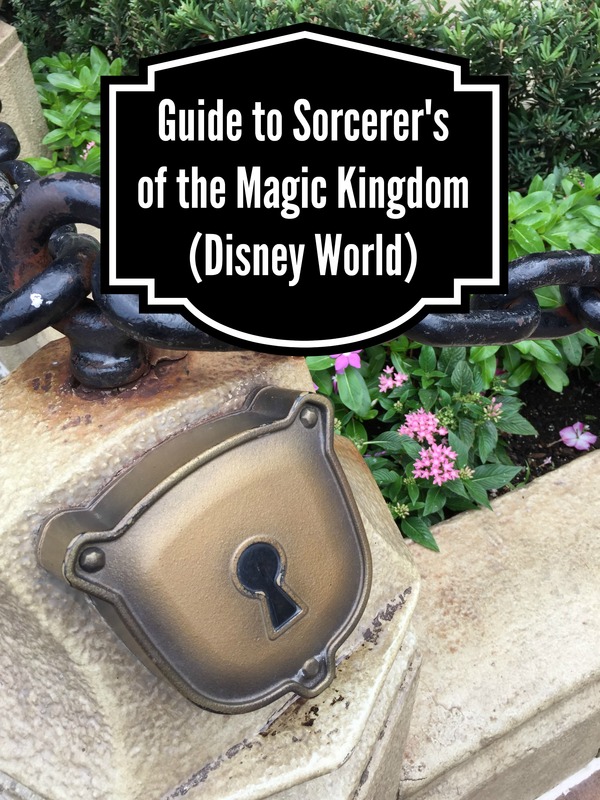 From the iconic buildings on Main Street to the scrapbook ready Disneyland tickets, you will be wowed. 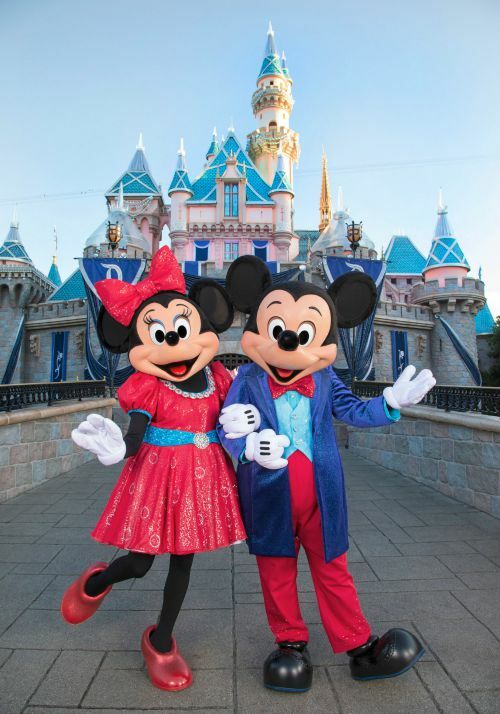 Since opening day in 1955, the Disneyland Resort has welcomed more than 750 million guests to The Happiest Place on Earth. My parents were known to visit Disneyland often as kids, with Tom Sawyer Island a favorite spot. There’s even a legendary story about my parents while dating which revolves around the Matterhorn, an iconic roller coaster attraction not seen in Orlando. So, you can say my love of Disneyland comes naturally. 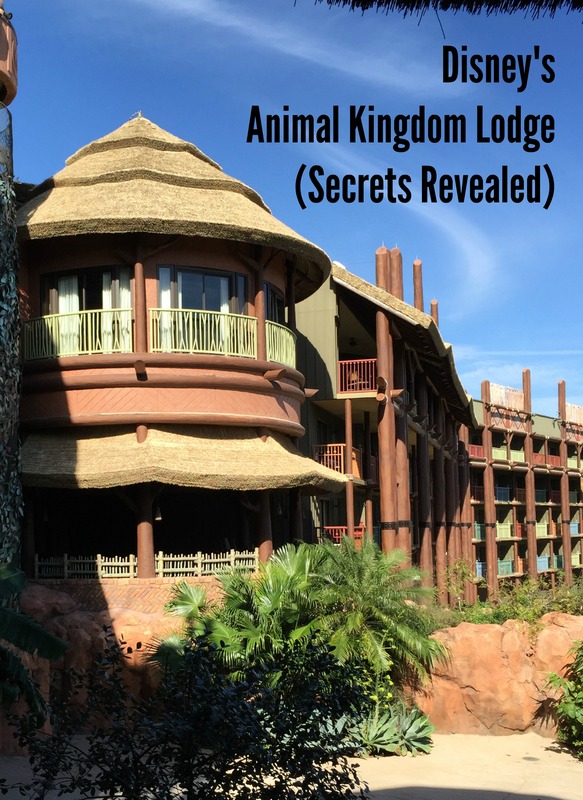 (Shhhhh……don’t tell, but I never even visited Walt Disney World in Florida until after I was married and in my 30s)! Though every Disney theme park is filled with magic, there’s just something extra special about Disneyland. Maybe it’s because I have amazing childhood memories there. Maybe it’s because I can feel Walt Disney’s legacy even more, knowing he walked these same corridors, rode some of these same attractions. No matter what it is……the special-ness cannot be denied. 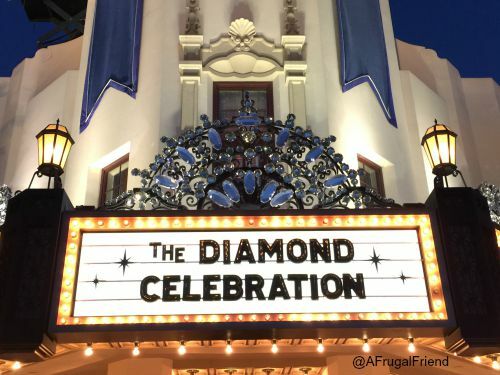 So let me take you on a quick tour of what you can expect during this Diamond Celebration, which kicked off in May and will likely continue into 2016 based on previous celebrations. 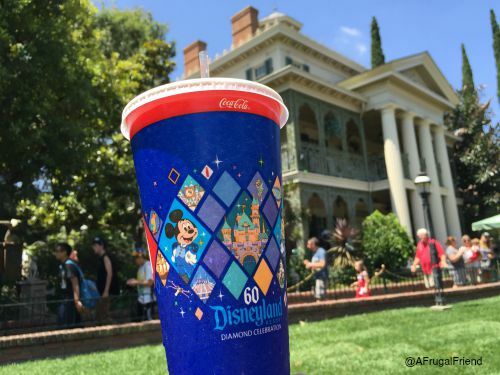 Disneyland has been taken over by diamonds……you’ll spy them everywhere, including on the disposable cups. 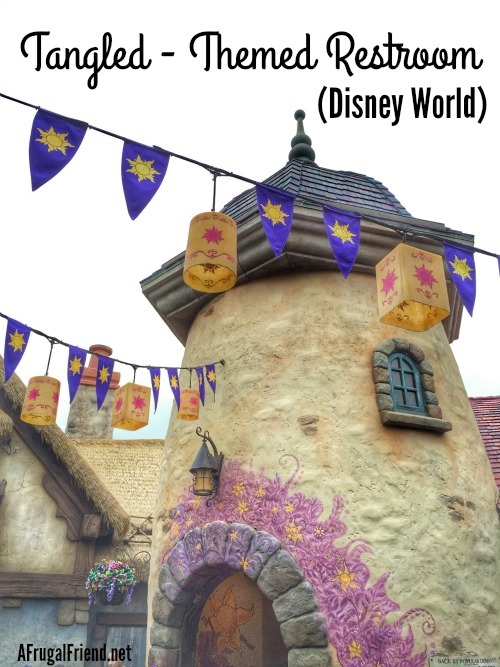 Speaking of these cups – do you know what my favorite money saving Disney tip is? Even Disneyland chefs have been inspired by the 60th anniversary. From the Main Street Bakery to favorite sit down restaurants and even counter service venues, you’ll spy special #Disneyland60 treats and menus! 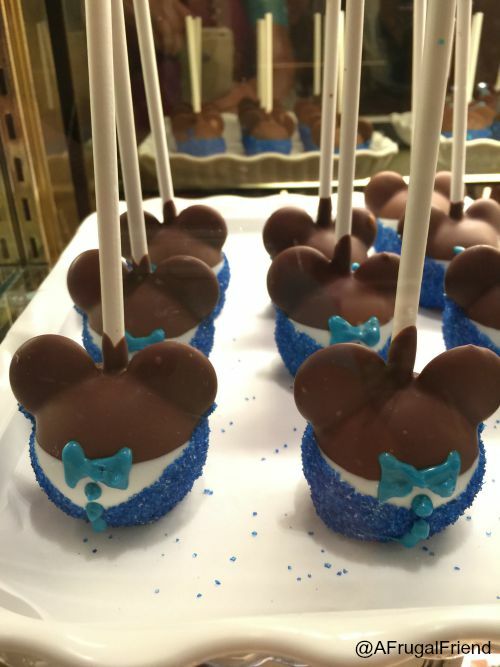 Fair warning – you’ll find edible blue sugar everywhere (from cake pops to caramel apples)! With any Disney special event, I just knew there would be new entertainment. 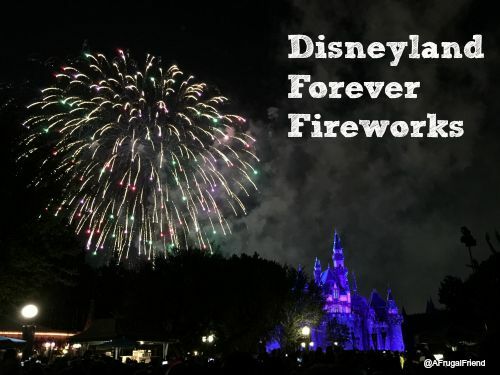 Presented by Honda, we were introduced to the new “Disneyland Forever” fireworks which come to life with a sprinkling of Tinker Bell’s pixie dust. There is nothing that completes your Disney day like watching the fireworks show. With pyrotechnics and music that tugs at your heartstrings, it’s not to be missed. Fireworks have a long history at Disneyland, having first been introduced in 1956 with the show, “Fantasy in the Sky”. 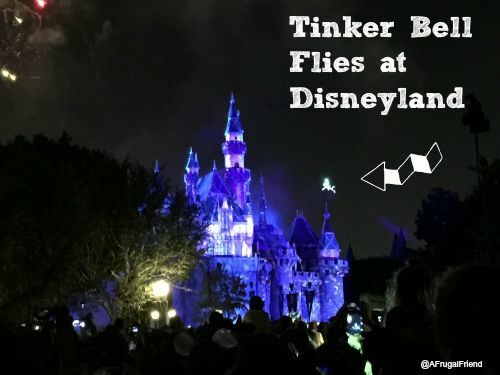 Did you know that Tinker Bell flies over Sleeping Beauty’s Castle at Disneyland? (And somehow she manages to get over to Florida to do the same thing at Cinderella’s castle at Magic Kingdom). This is something many first-timers don’t know and so I try to let parents know to be aware and surprise the kiddos. She will fly barring any weather condition issues. In fact, Tinker Bell has been flying over Sleeping Beauty’s castle since 1961. While this admittedly isn’t the greatest shot, you can see I captured the feisty fairy above. I’ve visited when another character has flown (Dumbo), but with the new fireworks show, Disney has added a new, special character……..Nemo “swims” across the sky. My photo didn’t turn out that great (so I didn’t post it here), but what a sight – I was not expecting that! It’s not just the fireworks that will garner your attention when the sun goes down. 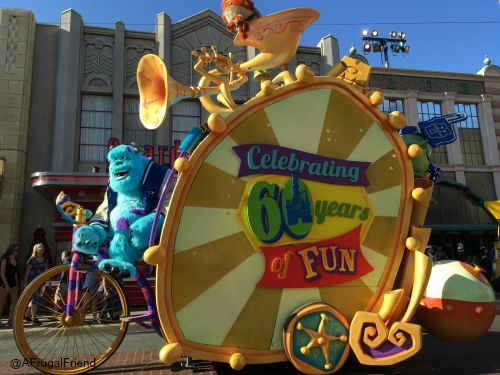 In fact, during the Disneyland 60th Celebration, you’ll want to make sure to see both the afternoon and evening parades. 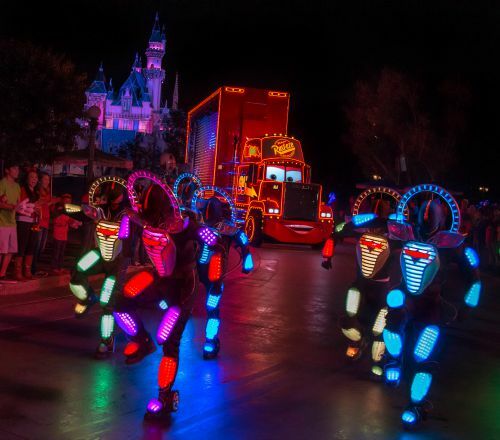 The new nighttime parade is called “Paint the Night” and you’ll want a front row seat. With so much going on during the anniversary, the only downside is trying to fit it all in. You see at Disneyland, there’s a nighttime parade, fireworks show and Fantasmic (something which isn’t an issue in Florida, as Fantasmic has a home at another theme park). And while I’m usually one to ride the rides during earlier nighttime events (much shorter lines), it’s hard to do that right now with all the entertainment! I didn’t want to miss a thing! Shades of blue are everywhere, and that includes the gift shops! 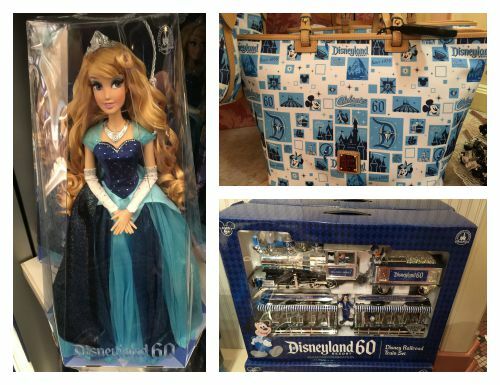 Merchandise themed with the 60th anniversary are in hot demand. My daughter and nephew got special interactive Mickey ears and wands along with Mickey and Minnie plush decked out in blue and plenty of sparkles. 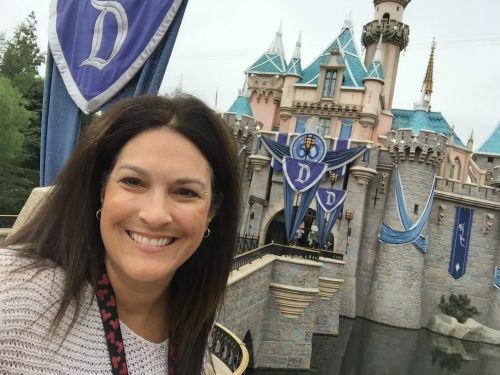 I loved the special Disneyland Railroad and the Disneyland60 Dooney and Burke purse – WOW! But it was the beautiful Princess Aurora Doll that commemorates the anniversary which stole my heart. Isn’t she lovely? 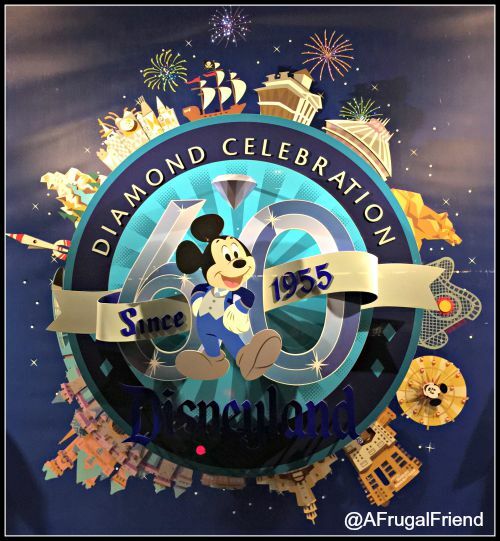 Did you think that the Disneyland Diamond Celebration stopped there? I never imagined that the celebration would extend across the way into the other theme park, Disney’s California Adventure, but it does! So no worries if your adventure takes you to California Adventure only. You can find all the specially themed merchandise in both theme parks. And the special treats. And the decorations. Oh, and did I mention special entertainment? Yes – you won’t want to miss Pixar’s Play Parade, which includes special mention of the 60 years of fun. This fun-filled presentation will take guests on an inspirational journey celebrating Walt Disney and his dream of Disneyland park. This story will be brought to life with fountains, animation and live-action film, lasers, special effects and a stirring musical score. With special narrator Neil Patrick Harris at the helm, the show brought out so much emotion. I dare you not to get choked up! One thing you’ll immediately take notice of is the iconic Carthay Circle Theatre Restaurant and Lounge, which opened in 2012 on Buena Vista Street. It stands 79 feet 6 inches tall, to the top of its cupola spire, and it is approximately ¾ scale to the original Carthay Circle Theatre, the site where Walt Disney’s animated classic, “Snow White and the Seven Dwarfs,” premiered in 1937. By way of contrast, Sleeping Beauty Castle in Disneyland stands 77 feet high and is designed to appear taller, due to forced perspective, when viewed from the other end of Main Street, U.S.A.
Stay tuned as I’ll soon share my dining experience there – yes, I took my sister along with our kiddos for dinner during this trip. I’m often asked which I love more – Disneyland or Walt Disney World. Truth be told, they are both incredibly different. Different attractions. Different shows. Both are magical and you cannot go wrong with a trip to either. But there’s something special about walking where Walt Disney walked. I wonder what he’d say if he could see it all now. 60 years of bringing smiles and making memories. My parents often talked of those E tickets!! Thanks for commenting Dorothy! I’ve never been to Disneyland, but I’ve been to Disney World twice, and it’s my favorite place in the whole world. One day we’ll make it to Disneyland too! Everything looks like so much fun at Disney! I love how beautiful the grounds are, and how cute the foods are! I’ve never been to Disneyland but I’ve always wanted to go. Maybe we’ll be able to go one day! I’ve been to Disneyland twice, my first in 1980 – using the tickets (yes, you ran out of those E tickets) and California Adventure was a parking lot. The second time was in January 2014. Bummed that some of the rides I wanted to go on were down for maintenance, but got to ride some cool rides at California Adventure. I would just love to go! I loved being able to go right from the Disneyland Hotel into the park via the monorail. I think the hotel had now changed its name since I was there in the 90’s. There’s nothing quite like a monorail ride! I remember when you could ride it from the hotel too!